I’ve been told that this dish is even better than my eggs benedict, which I think is my best breakfast dish! You can substitute another leafy green vegetable for spinach in this recipe, sometimes I substitute kale. Also sometimes I add a second egg for a heartier meal. This dish can also be easily scaled down to two servings, perfect for a romantic weekend brunch! Cook bacon in a pan until crispy. Remove from pan and reserve drippings. Add spinach to pan, sprinkle with salt and pepper, and saute for 1 minute. Brush ramekins with reserved bacon grease. Add English muffins to each ramekin split side up. Divide spinach between the four ramekins. Crumble bacon evenly between each ramekin. 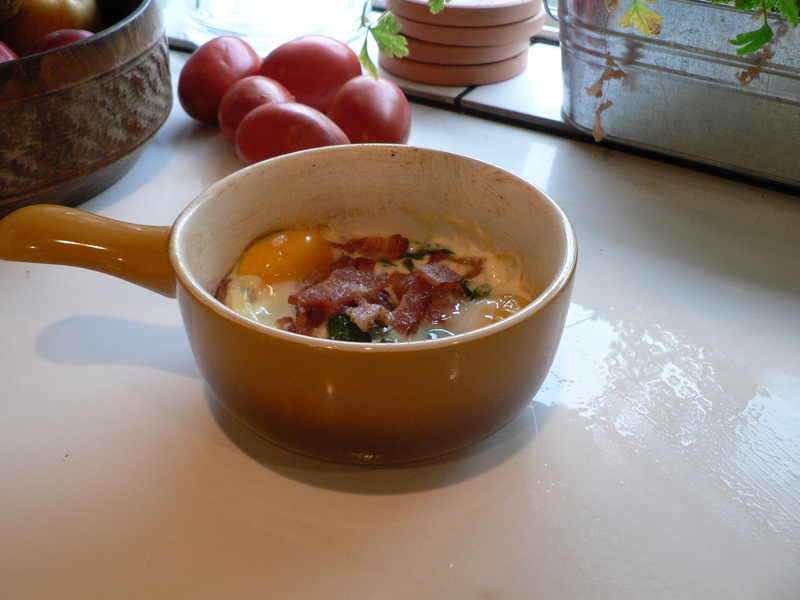 Crack eggs into each ramekin, being careful not to break the yolks. Add one tablespoon of cream to each. Bake for 14-16 minutes, until whites are set but yolks are still runny. Serve immediately. It’s remarkable to visit this web page and reading the views of all colleagues on the topic of this article, while I am also eager of getting know-how.